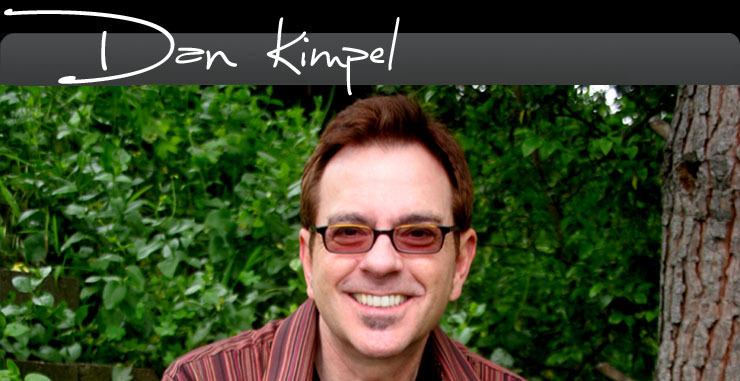 Acknowledged as one of the American media's foremost authorities on popular music and songwriters, Dan Kimpel contributes to a dizzying variety of print and electronic mediums: books, interactive CD's, magazines, web sites, feature films, videos and new media. His recent interview subjects include Natalie Cole, Ringo Starr, Akon, Bobby Brown, Ne-Yo, Melissa Etheridge, Kelly Clarkson, Mary J. Blige, Green Day, Usher, Alicia Keys, Metallica, Jason Mraz and Black Eyed Peas. Over six years, passengers on United Airlines heard Kimpel's incisive interviews with hit songwriters and recording artists worldwide on The United Entertainment Network. In addition, he has written, produced and/or voiced segments for TED, Regal Cinemas, and the presidential and vice presidential planes, Air Force One and Two. In 2008, under the auspices of DMI Music and Media Solutions, Dan began conducting interviews for Delta Airlines in-flight audio service, Delta On Air, co-hosting a show with Natalie Cole to debut her two time Grammy-Award winning album Still Unforgettable. In print, Dan contributes cover features to the west coast trade publication Music Connection magazine, plus a regular column, “Song Biz,” that includes a profile of a writer or composer in each issue. To date, Dan has conducted over 300 interviews for the magazine covering such diverse talents as Avril Lavigne, Alanis Morissette, Randy Newman, Glen Ballard, John Mayer, Jill Scott and Rufus Wainwright. Other publications that feature his writing include BMI World, ASCAP Playback, Grammy, SESAC Magazine, Film Music and American Songwriter. 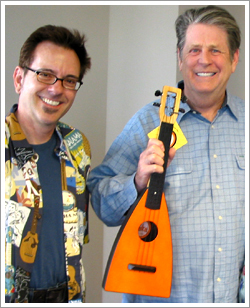 Dan Kimpel with Brian Wilson, 2005. Dan’s book on maximizing personal relationships, Networking Strategies For The New Music Business (ArtistPro/Thomson) is the follow up to his best-selling title, Networking in the Music Business. Over five years, he conducted a weeklong master class on networking at Sir Paul McCartney's Liverpool Institute for Performing Arts (LIPA) in the UK. Stateside, he lectures at colleges, universities and conferences across the U.S. and Canada, and he is currently on the faculty of Musician's Institute in Hollywood where he is the two-time MBP Teacher of the Year honoree. How They Made It: True Stories of How Music’s Biggest Stars Went From Start to Stardom, signing stories of today’s most successful recording artists, was released in 2006 by Hal Leonard. Electrify My Soul: Songwriters and the Spiritual Source followed in 2008 from Thomson/PTR and in 2009 came It All Begins with the Music: Developing Successful Artists & Careers for the New Music Business, co-authored with legendary A&R executive, Don Grierson. Dan also strategizes on projects and writes copy for record labels, music libraries, DVD releases and major label and independent recording artists with a client roster that has included the multi-platinum, Grammy-winning writing and production duo, Jimmy Jam and Terry Lewis and R&B legend Bill Withers. His resume includes a variety of services for the entertainment industry including event production and co-ordination and artist management/public relations consulting. Dan conducted an extensive series of on-camera interviews to commemorate the 90th anniversary of the American Society of Composers, Authors and Publishers with Quincy Jones, Marilyn Bergman, Queen Latifah, Mary J. Blige, Andre 3000 (OutKast), Randy Newman, Hal David and the late Elmer Bernstein. He also interviews all of the Society's award-winners in Pop, Film & Television and Rhythm and Soul, including Smokey Robinson, Metallica, Usher, Alicia Keys, Clint Eastwood, Jackson Browne, Elvis Costello, Timbaland and others. Dan began his career as a musician in his hometown, Lima, Ohio. He was a staff songwriter in Nashville and continued his performing, recording and composing careers in New York and Los Angeles. In Hollywood, his career took a new turn as he became instrumental with a non-profit organization: the Los Angeles Songwriters Showcase (LASS). In 1995, he was appointed creative director for the National Academy of Songwriters (NAS). At NAS, Dan oversaw all of the Academy's periodicals and publications and produced concerts and events with the most revered names in songwriting: Joni Mitchell, Crosby, Stills & Nash, Randy Newman, Don Henley, Quincy Jones, Tom Petty, Leiber & Stoller, Burt Bacharach, John Fogerty, Babyface, Glen Ballard and Diane Warren. In 1998, he exited the Academy to devote more time to writing, and was named editor of Film Music magazine. He also was a commentator for shows on DirecTV, delivering on-camera commentary on the subject of film soundtracks. Dan lives in the Eagle Rock neighborhood of Los Angeles, California.